This is a really tasty soup and requires very little effort. It’s one of those perfect weeknight meals that warms you on a cold winter night. You can also enjoy it in the summer because it is just darn good and takes so little time it hardly warms up your house. Pour chicken stock into a large pot and bring to a boil. Trim the lemongrass by cutting off the root end and the top 2/3 of the stalk. This provides you the “bulb” of the lemongrass. Remove the two outer leaves revealing the tender inside bulb. Mince the bulb and add the minced lemongrass bulb to the the pot. Continue to boil for another 1-2 minutes. 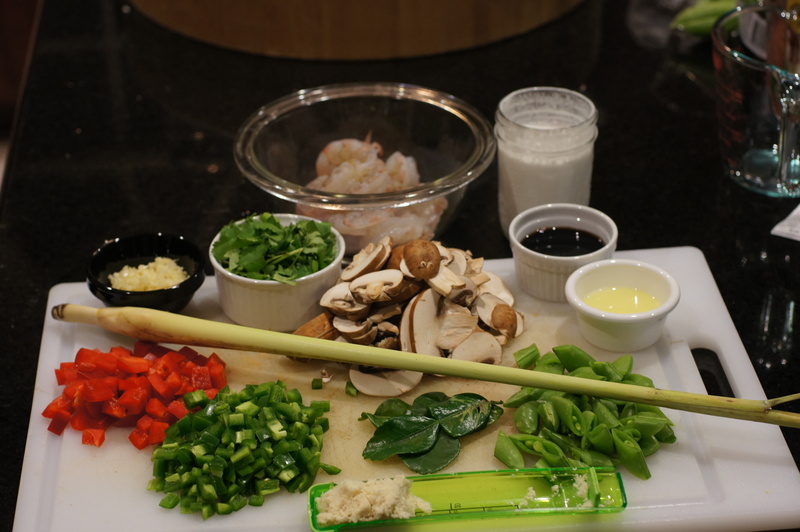 For additional flavor, take the top part of the lemongrass and crush it with a pot/pan. Tie it in a knot and add it to the stalk. 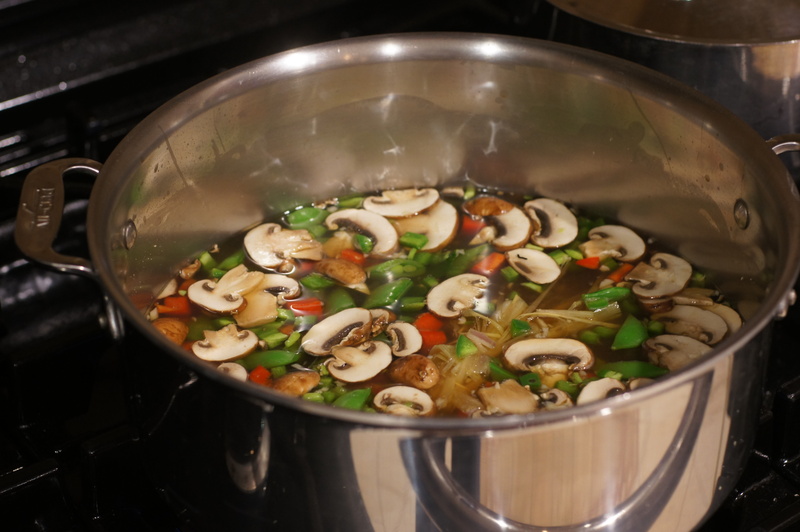 Next, add the garlic, chile, lime leaves, ginger, bell pepper, and mushrooms. Reduce heat to medium and simmer 1-2 minutes. Now, add the shrimp. 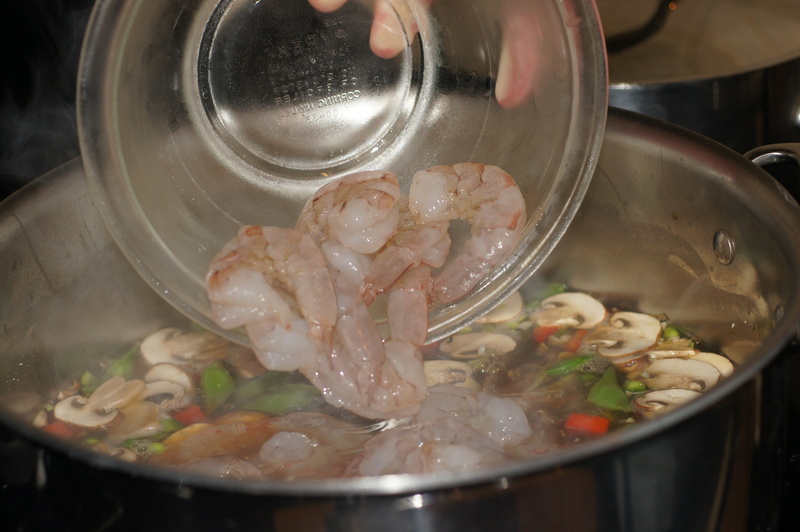 Simmer 3-4 minutes, or until shrimp is pink and plump. Reduce heat to medium-low and add the coconut milk plus fish sauce and lime juice. Stir well to combine and gently simmer until hot. Serve in bowls with sprinkled chopped fresh coriander. Enjoy. I hate it when I post things that are not accurate. Nonetheless, The High Heel Gourmet (nice blogger – go check her out) very politely pointed out in her comment that Tom Khaa meant galangal soup and I didn’t even use galangal in the recipe. Needless to say, I was and am a little chagrinned over this. For those of you unfamiliar, this is galangal. It looks like ginger in a way, doesn’t it? It’s because they are related. In fact, some people refer to galangal as “white ginger.” Nonetheless, as a result of The High Heel Gourmet’s comment, Baby Lady & I recently redid the recipe with galangal to determine the difference the use of galangal made. I also did some research on galangal. In doing the research, I found that there are 2 types of galangal; one believed to be from Indonesia and the other from China. Each galangal has a different flavor profile. The galangal that originated in Indonesia is also called “lengkuas” and has a multilayered, sharp flavor with a pine like aroma. This is the galangal that is more commonly found in in the US. 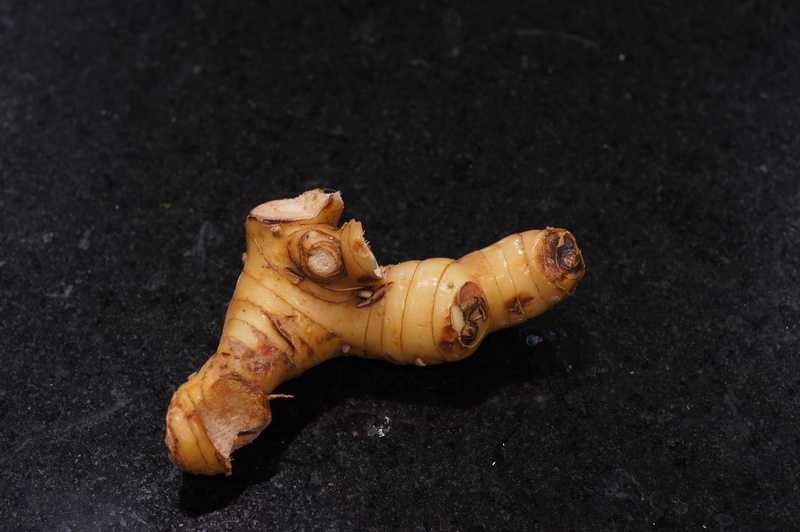 The galangal found in southern China has a pungent flavor and tastes like a combination of pepper and ginger. I will have to take various reports on this galangal’s flavor as accurate because I did not find this variety at any of the local Asian markets. This is the galangal that is popular in Thailand and locally called krachaai. Presumably, krachaai is the galangal used in this Thai soup. Regardless, depending upon the galangal used in the recipe, the flavor will vary. Because what we had available was the Indonesian lengkuas that is what we used. It definitely has a pine like aroma and a sharp flavor. Further, the difference between the use of ginger and galangal is as different as night and day. Ginger has a warm flavor whereas lengkuas has a cool flavor. Here is the redo with supporting photos. 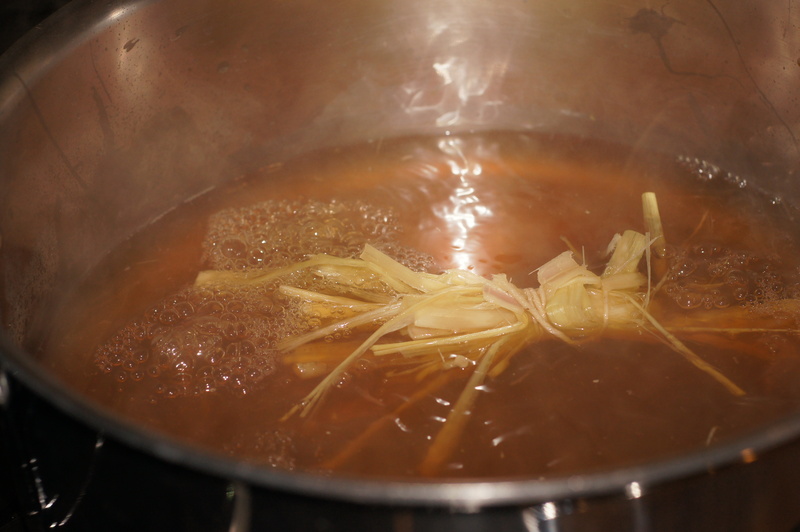 Pour chicken stock and lemongrass into a large pot and bring to a boil. Continue to boil for another 1-2 minutes. Next, add the garlic, chile, lime leaves, galangal, bell pepper, sugar snaps and mushrooms. Reduce heat to medium and simmer 1-2 minutes. Reduce heat to medium-low and add the coconut milk plus fish sauce and lime juice. Stir well to combine and gently simmer until hot. NOTES: Depending upon where you live, Kaffir lime leaves can be either unavailable or ridiculously expensive. This can create some problems with this dish (as well as many other Thai dishes). You see, it is difficult to find a suitable substitute for Kaffir lime leaves inasmuch as they have a distinct floral note. If you are faced with the inability to find Kaffir lime leaves you are presented 2 options. Some people recommend you simply skip the Kaffir lime leaves in the recipe, whereas, others recommend that for each fresh Kaffir lime leaf, use 1/2 of a small bay leaf plus 1/4 tsp of lime zest and 1/8 tsp fresh lemon thyme. Inasmuch as I have fresh Kaffir lime leaves available at the local Asian markets I haven’t tried the substitution so I make no comment on its propriety as a suitable substitute. If the soup is too sour for your taste, add 1/2 tsp. brown sugar or honey. If it is too spicy or you like it creamier, add more coconut milk. If is too salty, add another squeeze of lime juice. If not salty enough, add more fish sauce. Baby Lady likes to add chile garlic sauce for a little extra kick. You can also use red Thai curry paste (recipe found here) which not only provides a nice little kick but some extra depth of flavor. Last, if you want the soup to be more filling with additional depth of flavor you can always use additional vegetables of your choosing, i.e. scallions, tomatoes, bok choy, broccoli, asparagus, green peas, etc. It’s up to you. This is a soup that you can customize to accommodate your tastes. Have it your way. Just make sure you have it. Hi, Joy. Are you allergic to Crustaceans or all shellfish? My mom was allergic to Crustaceans because she was allergic to iodine which is found in Crustaceans. She was not allergic to clams, mussels, scallops, etc. 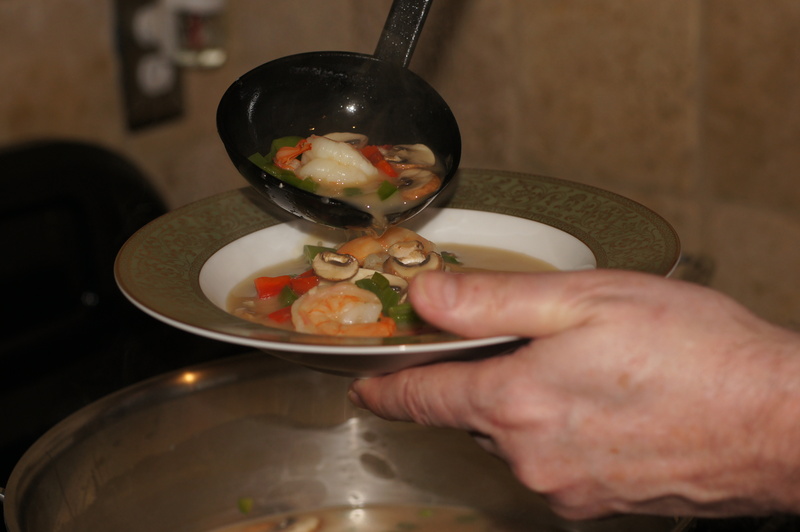 I would imagine this soup would be lovely with scallops as a substitute for the shrimp. 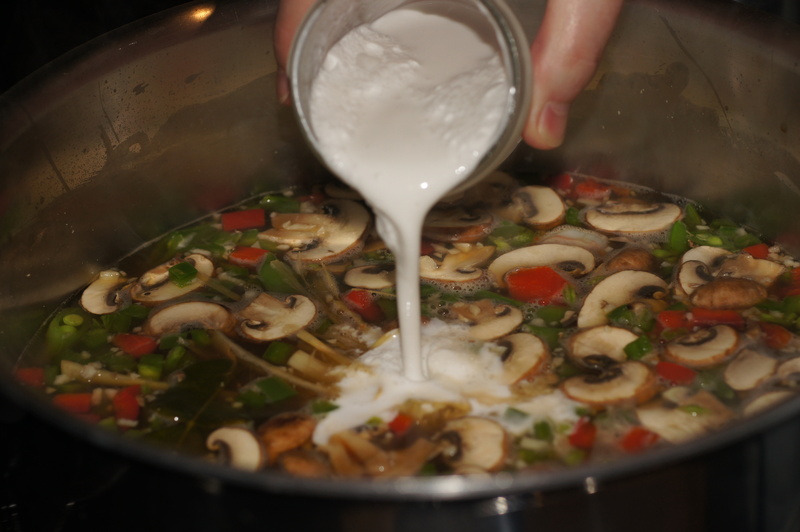 Also, a very similar soup is Tom Kha Gai, which is Thai coconut chicken soup. I can eat everything but shrimp and my older brother can eat everything but crabs…isn’t weird?! My friend made that too, I love Thai food. Great soup! I love this. I think it is made with dried lime leaves around here. I was wondering about the dashi you mentioned in the intro as this is supposed to be Thai, but then it is not included in the recipe. Did you mean the fish sauce instead? I have also had this with chicken instead of shrimp. Hi, Stefan. Thanks for the compliment. Also, I’m glad you catch these things so I can correct them. I actually meant chicken stock but was distracted while writing this. I need to figure out where the dashi came from. I really do need to be more attentive. 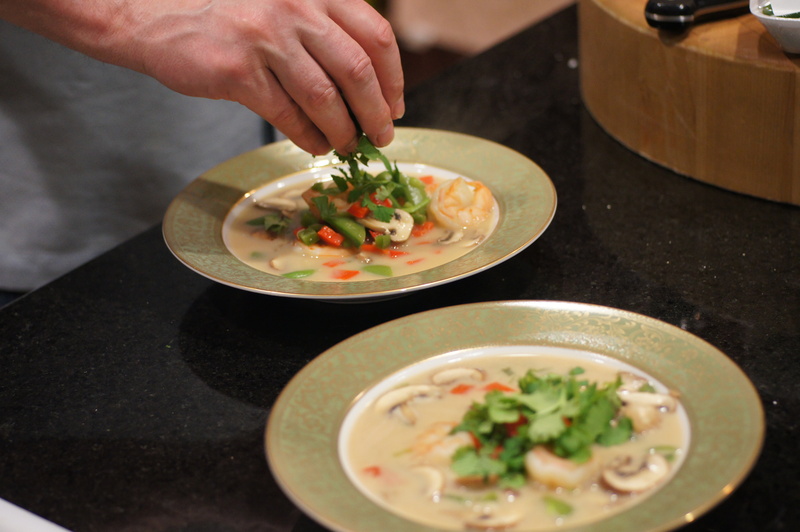 You are right that Tom Kha Kai is the version with chicken. 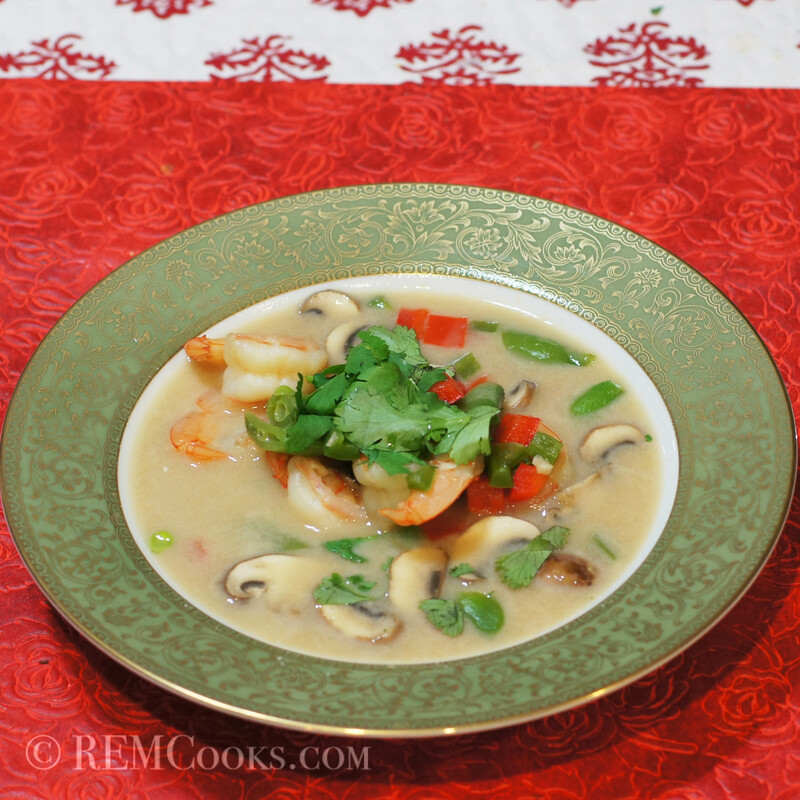 The version with shrimp is called Tom Kha Kung. Kai means chicken and Kung means shrimp. OK. Thanks for the info. I was wondering if it had to be something more because when I was looking at Tom Kha it appeared to mean coconut. One of the serious failings in the US is our selfish pride in not learning/teaching another language besides English. In many respects we are a rather backwards, self righteous society that believes we are so great that you should learn our language and we shouldn’t be bothered to learn yours. People along the French Canadian border refuse to learn French. People in the southwest along the Mexican border refuse to learn or speak Spanish. Bilingual education is not encouraged but is criticized as useless and only being taught to benefit “the illegals.” It’s so bad that many immigrants refuse to teach their own children their native language. It’s a shame because you lose your culture, your history and your diversity, not to mention your appreciation of others. Thanks, John, for the nice compliment. I always like to post step-by-step photos because some people learn by visualization. I learn better seeing someone do it first so I always feel a little guilty if there are no step-by-step photos. The Kaffir lime leaves are a seasonal thing and you will find them. Keep an eye out for them. I buy them and then freeze them if I don’t use them right away. The dried ones I find lose some of the nuances of their flavor. I buy and freeze fresh bay leaves, Richard, much like you do with kaffir. They have to be fresher than the dried ones in the spice aisle. Thanks for the tip. I love this soup. I think its just perfectly balanced and isn’t any trouble to make. Thanks for the recipe. It is next to impossible to get fresh kaffir leaves where I live. I have been using the dried ones but they just don’t do what it is supposed to do. I had been using lime zests but didn’t know about the bay leaf. So glad you taught me that! Hi, Deb. Thanks for your very nice compliment. This is one of Baby Lady and my favorite soups. Great flavors and simplicity. How can you go wrong with that. we have a tough time fining fresh kaffir lime leaves and only find them seasonally and only at the Asian markets. They also aren’t cheap. Thanks. Not being Asian I do not speak the lingo nor do I have authentic family recipes. I picked this recipe up several years ago from someone who was Asian and used the ginger, as opposed to galangal. I will have to try it with galangal to see the difference in flavor as it is readily available in the area. I know. I’m envy. Texas has all kind of Asian ingredients growing fresh too. You even have ong-choy! If you see any recipe that tell you to substitute Galangal with ginger, my suggestion is to “run” as fast as you could 🙂 It’s like telling someone to substitute the gorgonzola cheese with parmesan cheese. So different! I’m following your beautiful blog. Have you try any more sous vide? I have done a couple of sous vide experiments on the blog You can do a search for sous vide in the search window or you can look in the recipe index under entrees. I’ve done poached fish sous vide, poached lobster sous vide, a monkfish wrapped in Serano jamon with white asparagus, chicken breasts and porchetta. It’s a fascinating technique. It also heats up my kitchen and I need to insulate the 12 x 18 lexan tub. I think it will better hold the water temperature while minimizing the amount of heat in the kitchen. I’m considering buying a water oven myself after trying the traditional way (dipping thermometer in the pot filled with water for hours) on the stove top! I will have to investigate the unit some more. I like cooking fish, foie gras and chicken with this method but not so sold about it yet. This soup brings back memories for me. When my sweetheart and I were first dating (5+ yrs ago) we used to order/or make this soup and bond over its lemongrass & coconut goodness. Fast forward those years later and we have a flourishing kaffir lime tree (of which) we have sooooo many leaves we don’t quite know what to do with. Wish I could pass them onto you, if it weren’t for the fact I’m on another continent! Looks absolutely delicious and brings back good memories for me of a well loved dish!